It was an early start and the sun was out but it was still cold as we queued to sign on, before heading back to the van to kit up and apply bum cream – as this was going to be a long day in the saddle with 28 miles and 5000ft of climbing ahead (14 miles for a full loop). Chris admitted he’d been there on Monday (apparently not getting any cheeky practice in, he just happened to be passing with work) and he said it was going to be wet even with the sun out. When we got to stage one, which started off the Parkamoor bridleway and descended down to Coniston Water – crossing the fire road twice – he was right! Your author Neal, getting ready to pump the backside. They’ve used this stage before but this time we were riding a new top section. There were some boys behind us who had all the enduro gear on and sounded like they were fast so I let them through before the start then tried to tag on to the back to get some speed out of them – but it didn’t work out. The start of stage one was a rude awakening to the day and was littered with wet roots and sloppy mud. I only managed to follow them for 5ft before I slid off the track pointing sideways. This is a brute of a stage and a clear example of how far enduro racing has progressed in the UK. It was long, physical and technically challenging, littered with roots, rocks and mud. 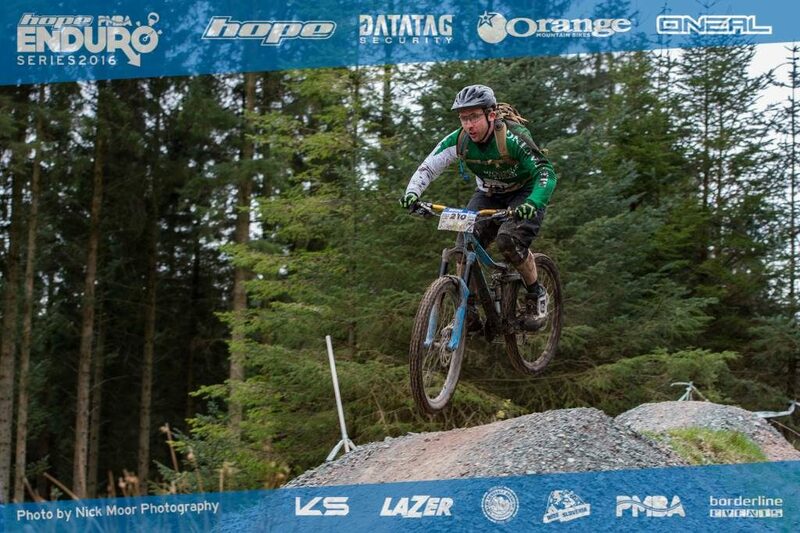 I raced the Scottish Downhill Association round one at Ae a few weeks ago and that track was far easier to ride than this. I knew come my race run I would make some mistakes on this stage so got it in my head to expect them and not get flustered when it happened. It was onto stage two and the transition started with a ride along the road, I’m not a big fan of riding on the road but when the sun’s out and your right next to Coniston Water having just finished a stage like that, it was actually pleasant, more than can be said for the right turn off the road and up the Lawson Park ascent back to the top which with the practice loop had to be done four times, two of them times right to the top of Carron Crag – the highest point in Grizedale Forest at 1030ft. 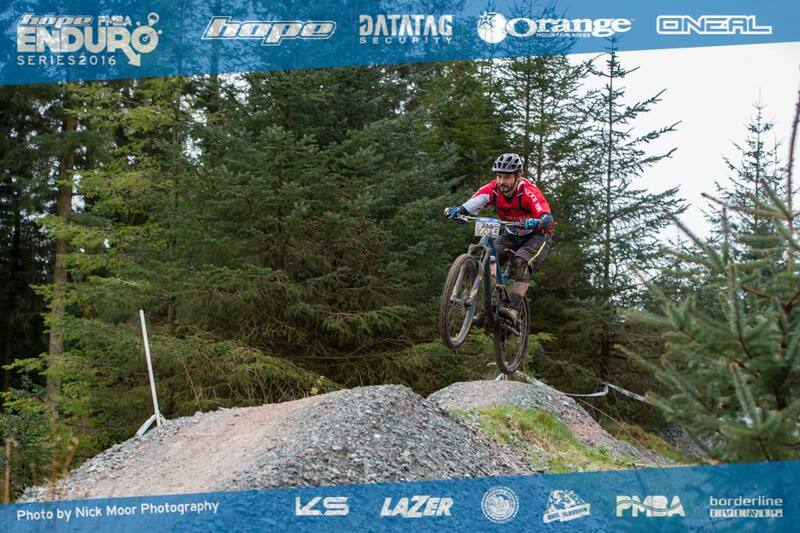 Stage two was a new track for PMBA and could be missed if you’d opted to do the lite race but those who missed it missed a belting track – possibly the most fun stage of the day. It started slightly muddy and rooty then turned into some really fast singletrack with some lovely slightly built-up corners which you could carry a lot of speed through. It finished near stage one by Coniston Water. Then it was to the top of Carron Crag for stage Three. This was the rocky walking path off the top, down to the fire road. Although this is a Lakes round this is probably the only stage that is indicative of proper Lakes riding and the type of riding that the bridleways round Grizedale offer, rocky, very rocky! This is fast and fun with loads of natural step downs to send, usually landing on more rocks! if your running tubes you’ve got to have dual ply tires on. When I finished my race run there where three people fixing punctures. It was back to the top of Carron Crag for the final stage and the longest of the day all the way from the top of Carron Crag back down to the visitors centre. 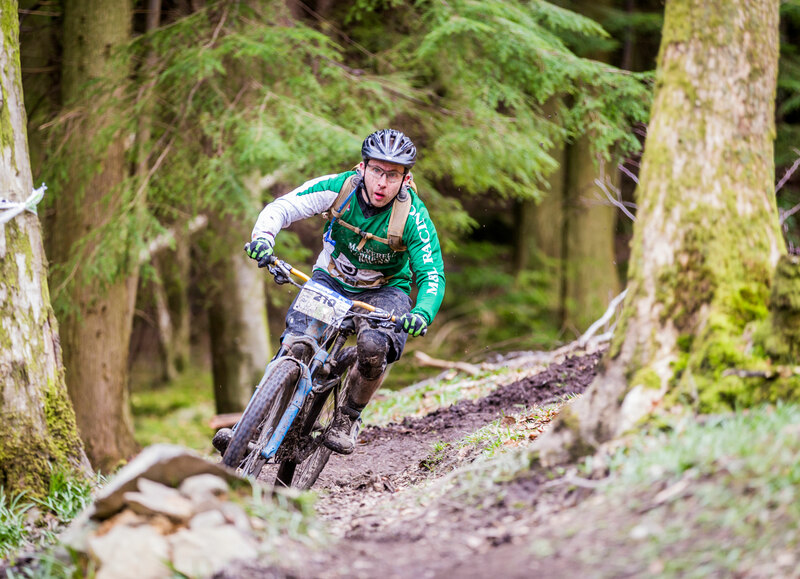 This time descending the tricky section through the woods to the black trail centre run – which is fun especially as they put some new doubles in the top section last year. After the black you could have done with a rest but they had decided to make us sprint along the fire road a few hundred meters, It felt like a few mile, at the end of a 28-mile day this was just plain nasty of them. The stage then cut right into the forest taking the track back to the visitor centre, which was a stage on its own last year! This was a muddy little section down to the rock slab, where stood two marshals. I think they were marshals they may just have been hecklers, who were giving everybody encouragement or abuse depending how you managed this tricky section, for me it was abuse as I tried to cut the rock slab tight but lost it and was caught by a tree. After watching I decided the chicken line to the left was as fast as the slab. By race run time this had turned into hecklers rock as a crowd had gathered to watch people crash. It finished with a short sprint back to the trail centre. Lunch from the cafe was included in the price as was water and flapjack at the top of the Lawson Park climb. The racing in the afternoon went fairly well for me with my main focus being beating fellow Mackerel man Chris – especially as he’d beat me by 0.98 seconds at The SDA a few weeks previous. The gaps between us at the end of each stage seemed consistent to what we were leaving at the start of each stage so I knew it was going to be close. I led off on the final stage and apart from an over the bars coming out the top woods I had a decent run (one crash per stage is generally pretty good for me). Chris soaring to victory (over Neal) on the black run. At the bottom I waited for over a minute for him to finish so was certain I must have took the win, as I waited to hand my timing chip in he crossed the line and I cockily shouted over ‘where you been’ unaware that he’d actually stopped to talk to someone at the start line and had beaten me by 10 seconds over the full day. We both finished mid way down the masters field. It had been a good day, these are well-organised races with good tracks and there was barely any queueing for stages – just enough time to get your breath back. I’ll be back for later rounds that’s for sure – hopefully with some more Mackerel and Laphroaig members.